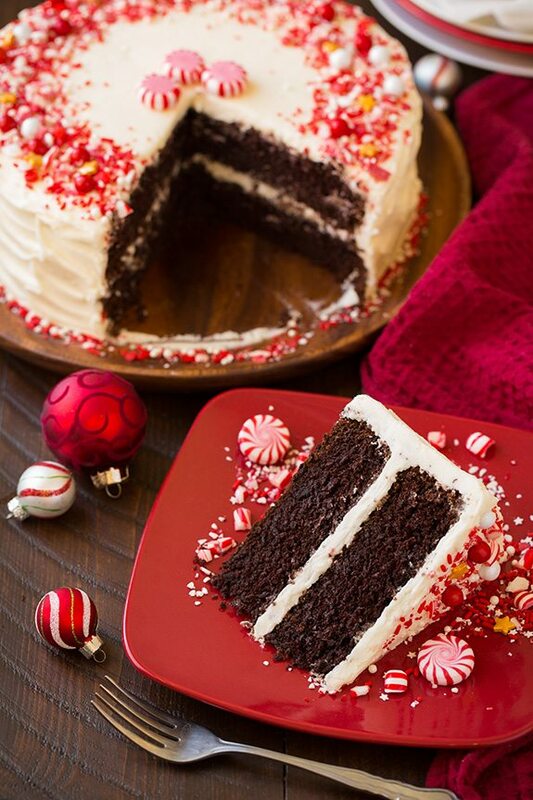 Peppermint Chocolate Cake is a perfectly festive holiday recipe! Decadent, rich and fluffy chocolate cake is flavored with the addition of peppermint and it’s an absolutely perfect pairing. 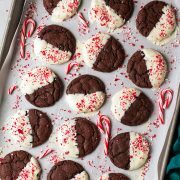 I’m all about peppermint everything lately, and one of my favorite combinations is chocolate and peppermint together – like York peppermint patties. Well imagine the flavors of a York or Junior Mints in soft and decadent cake form! 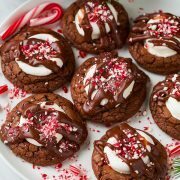 Yes, it’s seriously dreamy, and it should definitely be added to your holiday baking list – probably at the very top :). This cake is the infamous Hershey’s cake recipe which I added a few minor tweaks too, like adding buttermilk in place of the milk for more flavor and replacing some of the vanilla extract for peppermint. I’m pretty sure it was is actually the first time I’ve ever tried that recipe but I’m certain it won’t be the last. It’s a perfect chocolate cake that’s incredibly soft and deliciously chocolatey and moist, plus it it easily adapted to make the perfect peppermint cake for the holidays! 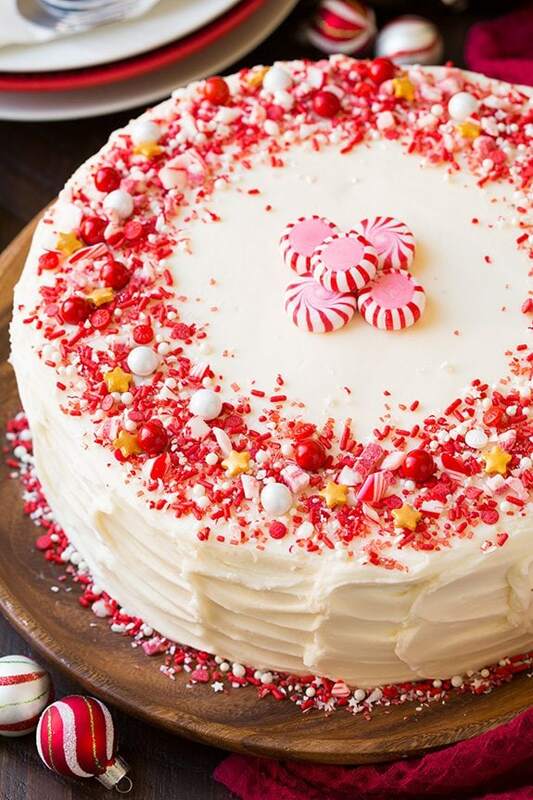 And this Peppermint Buttercream Frosting is what Christmas dreams are made of! More Delicious Cake Recipes to Try! 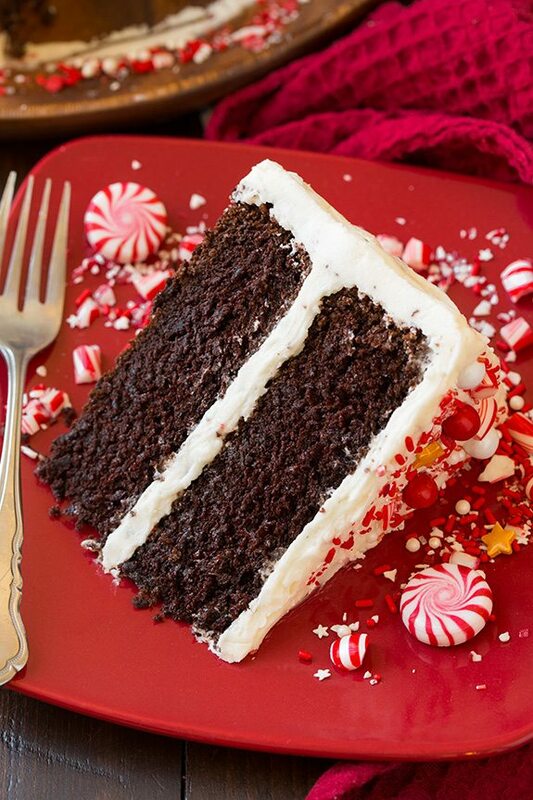 Peppermint Chocolate Cake is a perfectly festive holiday recipe! Decadent, rich and fluffy chocolate cake is flavored with the addition of peppermint and it's an absolutely perfect pairing. For the cake: Preheat oven to 350 degrees. Butter 2 9-inch round baking pans and line with a round of parchment paper, butter parchment. Lightly dust pans with cocoa powder shaking out excess. Set aside. In a large mixing bowl whisk together flour, sugar, cocoa powder, baking soda, baking powder and salt. Add buttermilk, vegetable oil, eggs, peppermint extract and vanilla extract, then using an electric hand mixer blend mixture until on low until combined then increase speed to medium and mix 2 minutes. Mix in boiling water. Divide batter evenly among prepared baking pans. Bake in preheated oven 30 - 35 minutes then transfer to wire racks to cool for 10 minutes. Run knife around edges of cake to ensure the are loosened then invert onto wire racks to cool completely. Once cool frost with Peppermint Buttercream Frosting. Store cake in an airtight container at room temperature or in refrigerator. For the frosting: In the bowl of an electric stand mixer whip butter until pale and fluffy. 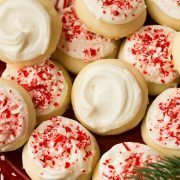 Add in 3 Tbsp of the cream, the peppermint extract and vanilla extract and 1 cup of the powdered sugar and mix until combined. Add remaining powdered sugar and mix on low speed until blended and increase to medium-high speed and whip until light and fluffy, while adding in additional cream 1/2 Tbsp at a time to reach the right consistency. Stacey: I made this for a family party tonight and it was a hit. It’s a fairly dense cake and if I were to make it again I’d decrease the baking powder as it rose a bit too much and then fell, living here in high altitude. I also baked it for 40 minutes at 375 degrees. The flavor of the cake is delicious and deeply chocolatey!